Janet Wickell. The Spruce Crafts, 2009. The King's Crown quilt block pattern explains how to make one quilt block that finishes at 12" square. The block is sewn with a combination of squares, single triangles, and half-square triangle units. Look at the image closely, and you'll see that the two half-square triangle units that meet at the block's outer midpoints could be constructed differently — by piecing Flying Geese units. See the option below the cutting instructions if you'd like to switch to Flying Geese. The center square is technically a tiny, tiny bit smaller than the square we'll cut but the difference isn't enough to create a problem. King's Crown looks good when sashing is sewn between blocks, or when an alternate block is used beside it. Try a Snowball quilt block with tips that meet at the triangle points along the side of the King's Crown. You might prefer to alter fabrics cut for the corner squares. Usie two fabrics and place the like fabrics diagonally to create four patch units where the corners of blocks meet. Work with even more colors for a scrappier look. Use the suggested fabrics as a guide but don't hesitate to choose other colors or fabric types. 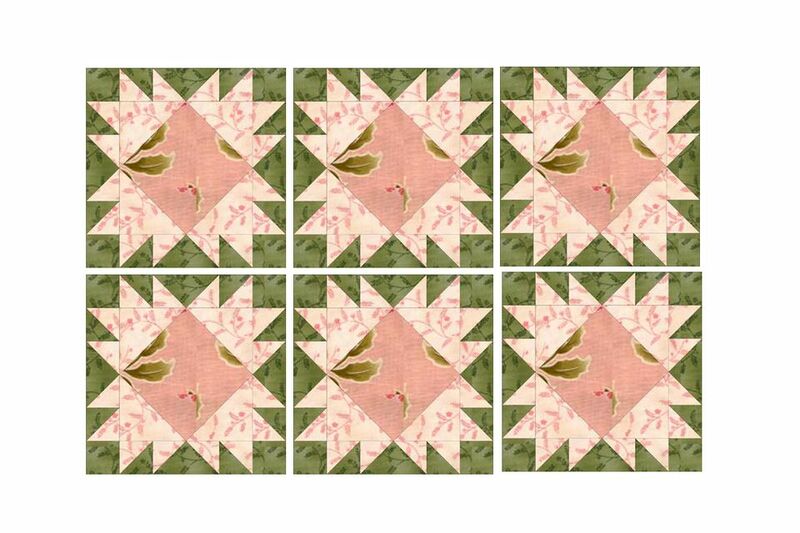 To replace mid-point half square triangles with Flying Geese, eliminate (4) of the green 2-7/8" squares and (4) of the white/pink 2-7/8" squares. Cut (4) 2-1/2" x 4-1/2" green rectangles and (8) 2-1/2" squares. Assemble as you would for quick pieced Flying Geese, orienting angles as shown in the illustration on this page. You could also use the no waste Flying Geese method to assemble these popular patchwork units. Sew a triangle cut from a 4-7/8" square to one side of the large center square, matching midpoints carefully (fold each and crease to find the centers. Press seam allowance towards the center square. Sew a second triangle to the opposite side of the square and press. Sew the remaining triangles to the block center. Use a quick pieced half square triangle method to combine each 2-7/8" white/pink square with a green square of the same size. The result will be (16) half square triangle units that each measure 2-1/2" x 2-1/2". Arrange the block components into three rows as shown. Sew pieces in each row together (you'll need to sew together the narrow, vertical columns in the middle row). Join the rows, pressing seam allowances in opposite directions beforehand where possible. Match seam intersections carefully and secure with straight pins to keep fabrics from shifting. Your block should measure 12-1/2" x 12-1/2". Try using the Magic 8 half square triangle method if you plan to make lots of quilt blocks.